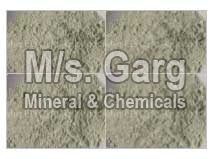 We are engaged in offering a diverse range of Pyrophyllite Powder that is a secondary mineral of composition Al2O3.4SiO2.H2O. It is hydrated aluminum silicate. It resembles talc in physical properties but there is a little difference. Pyrophyllite is harder in comparison of talc. It does not flux when fired. In India it is mainly produced from M.P., Rajasthan and U.P. It is used in the ceramic products, particularly refractory. It is majorly used in insecticide industry where it acts as filler.